Inscriptions: Designation, signature, date,. In pencil at u.c. : "This suite was made especially for the pleasure of my children." 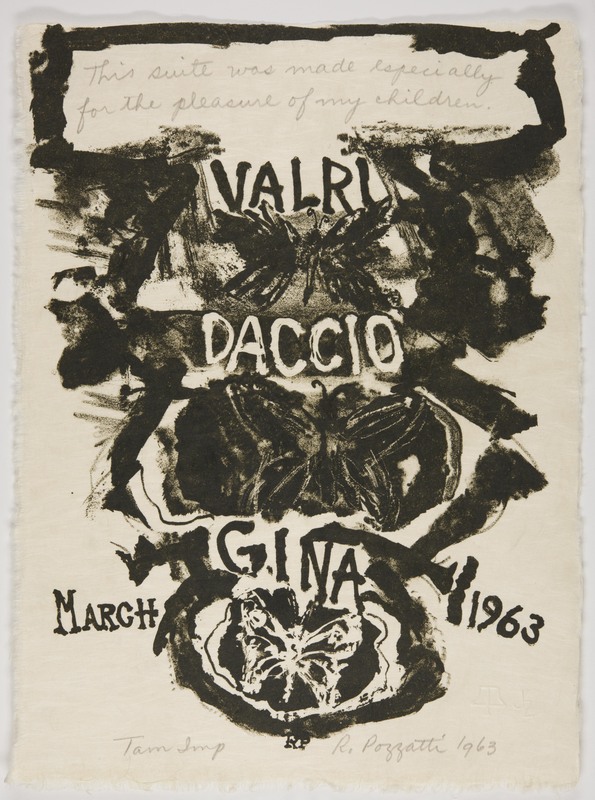 "Valri, Daccio, and Gina" written in vertical row in plate; blindstamps of Tamarind and the printer at l.c. "Dedication Page (II)." Loss and Restitution: The Story of the Grunwald Family Collection. Los Angeles: Hammer Museum, 2017. https://​hammer.ucla.edu/​collections/​grunwald-center-collection/​loss-and-restitution-the-story-of-the-grunwald-family-collection/​art/​art/​dedication-page-ii/​.